​Below you will find a list of selected peer-reviewed publications that writers on this website contributed to, along with an abstract providing an overview of the research. This paper investigates the peculiar nature of competition in the broadcasting market for live English Premier League matches in the United Kingdom. Following the movement from free-to-air to subscription television in 1992, British Sky Broadcasting secured a monopoly on live broadcasting rights. The exclusive arrangements were later found to be in breach of European competition law and resulted in competition from the start of the 2007-08 season. However, competition has not reduced prices charged to consumers. Both the overall cost to consumers and the price per game are higher with competing broadcasters than under a monopoly. Full text will be available in due course. Using data on league position for clubs that have participated in English football leagues for 21 seasons, this paper tests, using spatial econometric techniques, whether clubs’ within-season performances are positively affected by better performances of other clubs located geographically closer to them. The paper provides evidence of positive spatial dependence between clubs’ performance. This means that proximity to high-performing clubs drives others to perform better, ceteris paribus. This is consistent with the view in regional analysis that spatial factors are important considerations in understanding business performance. In 2001, the All-Ireland Gaelic Football competition changed from being a singleknockout tournament to a quasi-double knockout competition. Similar natural experiments in economics and operational research theory suggest such a change should reduce the competitive balance in the competition. Using a Hirschmann–Herfindahl Index measure of concentration and a bootstrapping approach, we confirm that the new structure leads to a less competitive outcome and, importantly, this outcome is less uncertain. Our bootstrapped results show that in the long run, with larger samples, there is less competitive balance in the new competition structure than in the older structure competition structure. Finally, we also consider a stochastic dominance approach to evaluating the change in tournament structure, but the low power due to the presence of ties in our small sample leads to an inconclusive outcome. Growing evidence suggests regional economic factors impact on individual outcomes, such as life expectancy and well-being. This article investigates the impact that player-specific and regional differences have on the number of senior international appearances football players accumulate over their careers, for six UEFA member countries, from 1993 to 2014. The results indicate that both individual and regional variables can explain the number of caps a player receives over the course of their career. We find that an individual's career length positively influences the number of international caps accrued. Players born in wealthier and more populous regions accumulate a greater number of international appearances. Distance from the capital has no effect, however, the number of youth academies in the player’s region of birth has a significant positive effect. Full text available Spring 2018. Thibaut, E., Eakins, J., Vos, S., & Scheerder, J. (2017). The determinants and income elasticities of direct and indirect sports expenditure categories. 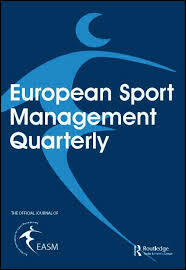 European Sport Management Quarterly, 1-18. The current study investigates the income elasticities and socio-economic determinants of direct and indirect sports expenditure categories by means of a log normal hurdle regression.The data stem from a representative sample of 3005 Flemish families with school-aged children, gathered through a sports-specific survey. A log normal hurdle regression was used to calculate the determining factors and expenditure elasticities of expenditure on sports participation.The results indicate that income, education and the age of the youngest child are positively related to almost all sports expenditure categories, while the number of family members and degree of urbanisation are significant for only a number of the expenditure categories. The elasticity value of the direct sports expenses is smaller than is the case for indirect sports expenditure. Between the expenditure categories large differences exist, as relatively large elasticities are found for sports holidays, transport and sports food and drinks, as opposed to low values of sports events, sports club membership, entrance fees for sports infrastructure, sports camps, clothing, footwear and equipment. The fact that income significantly influences all expenditure categories demonstrates that further policy intervention is required to make sports consumption more accessible to lower income groups. Sports enterprises and policy-makers need to be aware that negative income shifts have a more profound impact on the indirect expenditure categories, and that certain sports activities (e.g. participation events) are relatively more favoured by low-income groups than is the case for sports club membership. ​Butler, R., & Butler, D. (2017). Fergie Time and the Allocation of Additional Time: Evidence from the English Premier League 2009 to 2013. International Journal of Sport Finance, 12(3). Thibaut, E., Eakins, J., Vos, S., & Scheerder, J. (2016). Time and money expenditure in sports participation: The role of income in consuming the most practiced sports activities in Flanders. Sport Management Review. ​Given the recent economic crisis and the risen poverty rates, sports managers need to get insight in the effect of income and other socio-economic determinants on the household time and money that is spent on sports participation. By means of a Tobit regression, this study analyses the magnitude of the income effect for the thirteen most practiced sports by households in Flanders (the Dutch speaking part of Belgium), which are soccer, swimming, dance, cycling, running, fitness, tennis, horse riding, winter sports, martial arts, volleyball, walking and basketball. The results demonstrate that income has a positive effect on both time and money expenditure on sports participation, although differences are found between the 13 sports activities. For example, the effect of income on time and money expenditure is relatively high for sports activities like running and winter sports, while it is lower for other sports such as fitness, horse riding, walking and swimming. Commercial enterprises can use the results of this study to identify which sports to focus on, and how they will organise their segmentation process. For government, the results demonstrate which barriers prevent people from taking part in specific sports activities, based upon which they should evaluate their policy decisions. Butler, D., & Butler, R. (2016). Rule changes and incentives in the League of Ireland from 1970 to 2014. Soccer & Society, 1-15. We consider how five rule changes in the League of Ireland have affected the amount of goals scored in the domestic league from 1970 to 2014. Altering the rules represents a significant departure from the previous season and changes the incentive structure for teams. Numerous individual rule changes were imposed on the league during this period, each with the intention of improving playing standards and incentivizing more attacking football. This paper describes the impact of three new points systems introduced in 1981–1982, 1982–1983 and 1993–1994, the introduction of the First Division League in 1985–1986, and the switch to a single calendar year league with a March–November schedule in 2003 known as Summer Soccer. A retrospective analysis of goals per season and single match outcomes suggests that changes to the points system have not resulted in an increase in the number of goals scored in the Premier Division, nor has the introduction of the First Division. Eakins, J. (2016). An examination of the determinants of Irish household sports expenditures and the effects of the economic recession. European Sport Management Quarterly, 16(1), 86-105. This study examines the determinants of four household sport expenditure items. The primary objective is to examine the effects of the recent economic recession in Ireland on these expenditures. This study is the first to analyse Irish household sport expenditure data and the first to study the effects of the economic recession on these items. The social and economic characteristics of Irish households affect each sports item in differing ways. The presence of children of a particular age appears to be a strong determinant of spending on categories of sports which involve more physical activity (sport participation and leisure fees). Other categories of sports are influenced more by income (attendance at sporting events) and age and social status (club subscriptions). For some categories of sport spending there is a strong link with how the economy is performing, whereas for others household characteristics play just as important a role. Considine, J., & Doran, J. (2016). Evaluation of an informal rule for the allocation of sports capital funding. Public Choice, 168(1-2), 43-54. ​Significant empirical research has highlighted the existence of pork barrel politics. This is where public expenditure is targeted at particular regions based on the logic of collective action: political entrepreneurs maximize their chances of re-election by searching for and implementing programs or projects characterized by ‘concentrated benefits’ for key constituents and broadly dispersed costs. Using data on capital grants to Irish sports teams for 1998–2015, this paper analyzes the extent to which an informal rule can correct this bias. The case of allocating sports capital grants is particularly interesting since academic research, media commentary, and ministerial statements all seem to confirm the existence of political bias with such allocations in Ireland. Specifically, the geographical distribution of the grants are clearly linked to the Minister for Sport: that minister’s constituent county receives significantly higher per capita grant allocation than any other county. The grants were suspended in 2009 because of a fiscal crisis arising from the recession. When the grants were restored in 2012, a new informal rule for allocations was introduced. That informal rule was introduced to reduce the extent of pork barrel politics by ensuring that no county received less than 75 % or more than 150 % of the national average of the per capita grant allocations. The present study evaluated the effectiveness of that informal rule in reducing pork barrel politics in Irish sports capital grant allocations. Butler, D., Butler, R., & Considine, J. (2016). What “The Simpsons” Can Teach Us About Sports Economics. Journal of Economics and Finance Education, 12, (2), 88-100. This paper provides an insight into the teaching of economics. Using sport and The Simpsons one can do some of the heavy lifting when teaching the subject, as these topics generally engage students and provide ample analogies from which one can explore and discuss key economic concepts. The paper does not seek to provide a deep examination of the economics of sport, but merely to illustrate how The Simpsons and sport can be used to teach fundamental economic concepts. Eakins, J. (2016). Household gambling expenditures and the Irish recession. International Gambling Studies, 16(2), 211-230. This article examines the determinants of household gambling expenditures in Ireland and the effects of the recession on these expenditures using a large micro data-set, the Irish Household Budget Survey (HBS). Two gambling expenditures are examined, bookmaker tote betting and spending on the national lottery. Households with an older and a less educated head of household participate in and spend more on both forms of gambling while the presence of children in the households tends to reduce participation and spending in gambling. There is also evidence to suggest that households with an unemployed head of household have a higher likelihood of participation in gambling. The recession has affected the two forms of gambling in different ways. Lottery expenditures appear resilient to the effects of the recession. This is demonstrated in the estimated expenditure elasticities in particular. Bookmaker/tote expenditures have changed from a necessity to a luxury good, while lottery expenditures have increased in their necessity status. This can be explained by the fact that playing the lottery requires less time, knowledge and risk and has potentially greater benefits attached to it in comparison to bookmaker/tote betting. During a recession these factors become much more prevalent. Butler, D., & Butler, R. (2015). The Relative Age Effect and Under-21 Irish Association Football: A Natural Experiment and Policy Recommendations. The Economic and Social Review, 46(4, Winter), 511-519. A relative age effect refers to the presence of a bias towards relatively older children assembled collectively within a selection year. We consider this in association football (soccer) for Republic of Ireland under twenty-one international footballers over two intervals: from November 1981 to November 1994 and from September 2007 to May 2013. As the registration date for organised soccer in Ireland changed between both periods, these intervals provide scope for a natural experiment to test for a shifting relative age effect. The study confirms the existence of a relative age effect, with a selection bias toward players born in the earlier months of the registration year for both intervals. ​Considine, J., Crowley, F., Foley, S., & O’Connor, M. (2008). Irish national lottery sports capital grant allocations, 1999–2007: Natural experiments on political influence. Economic Affairs, 28(3), 38-44.
rish National Lottery Sports Capital Grant Allocations show a clear bias towards the geographical areas represented by the Minister for Arts, Sports and Tourism and the Minister for Finance. This bias is the result of the procedures by which the funds are allocated. Considine, J., Coffey, S., & Kiely, D. (2004). Irish sports capital funding: A public choice perspective. European Sport Management Quarterly, 4(3), 150-169.
n the last five years, the public funding of large scale sports facilities in Ireland has been the subject of investigations by the Attorney General, the Comptroller and Auditor General and government appointed independent consultants. During the same period there has been a growing scent of sports pork from the allocation of National Lottery funded sports capital grants for smaller sports facilities around the country. Public choice economists, with their assumption of self‐interested political actors pursuing their preferences through the political process, would not be surprised by these events. This paper explains how the public choice perspective offers, the best explanation of sports capital funding in Ireland.